Whether you are interested in professional tree pruning, stump and tree removal services, tree pest control, root care, or are looking to get a free estimate on some other kind of tree maintenance that needs to be done on your property, people throughout Northern Virginia and beyond are choosing Growing Earth Tree Care. Why? We offer people from Ashburn, Falls Church, Great Falls, Alexandria, Vienna, Springfield, and other regions experienced and knowledgeable tree care. In fact, we are an award-winning team of tree preservation experts who have been serving the communities we live in since 1976! That means we are fast-approaching a half-century of providing tree health and wellness to Ashburn, Vienna, and other locations. Before we dive into today’s topic about tree care “don’ts”, allow us to explain a little bit more about what a certified arborist can do for you. Firstly, we are a full-service tree care company, meaning we can provide residential and commercial properties with expert tree care services. Our breadth of tree maintenance services ranges from tree preservation, tree pruning, cabling and bracing services, tree growth regulator treatments, stump grinding, tree fertilization, and beyond. Our clients also have a variety to them. Some are property managers, some represent commercial properties, some are residential homeowners, and some are HOAs. We are proud of the way we are able to service a plethora of tree maintenance needs from a range of customer types. It goes to show that being a local tree care company that is also accredited by the Tree Care Industry Association can do a lot for your reputation, as can being highly rated by the Washington Area Better Business Bureau and Angie’s List. Our founder was Benjamin L. White, who was a Fairfax County arborist. The current owners, James and Paul Martin, but have been president of the Mid=Atlantic Chapter of the AI International Society of Arboriculture (MAC-ISA). But their association with organized tree care doesn’t stop there, as both served as chairmen of the Tree Climbing Competition. Jim also happens to be a certified proctor for the Tree Worker Certification test. As if all of that weren’t enough, Jim is an I.S.A. Certified Arborist, Certified Pest Control applicator, a Certified Tree Worker, and a Maryland Licensed Tree Expert. 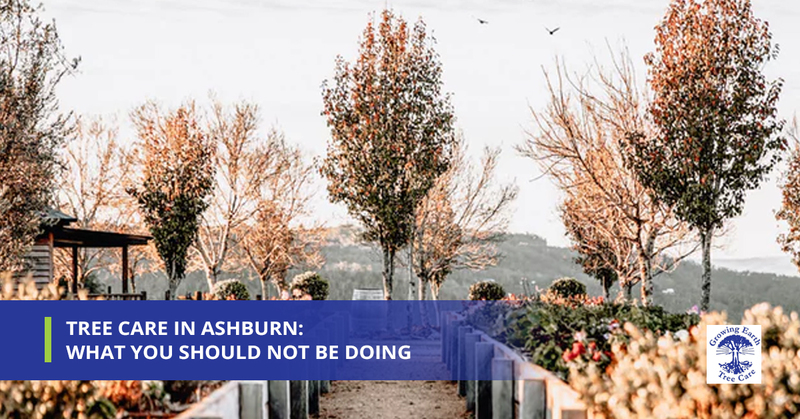 Now that we’ve (hopefully) convinced our readers about our tree company’s credentials in the world of tree service in Ashburn, let’s move onto today’s promised topic, about tree care and what you shouldn’t be doing. We’ll address some tree care myths as well. Read on if you are interested in gleaning a trick of the trade or two from your local “tree doctors” at Growing Earth Tree Care! This isn’t a total lie, as there is an element of truth to it. Using stakes will help some smaller trees stay upright after you’ve planted them. If it’s a tree that can stand up on its own, then it likely doesn’t need to be staked unless you happen to be in an especially windy area. Using stakes when it’s not necessary can actually hinder the proper development of your young tree and might end up creating new health problems for the tree. If staking is necessary for the tree to stay upright, make sure you check it frequently so that you can remove the stakes as soon as possible. If you do end up using stakes, make sure you don’t stake it improperly. That means not using materials like rope, string, or wire to tie down your tree straight. Instead, use tying materials which are both soft and wide. Again, there is some truth to this statement. Pruning your tree will stimulate a certain degree of sprout growth, but it isn’t a technique that should be utilized often. When a tree is pruned and dense sprout growth ensues, this takes up a large portion of the tree’s energy. That is why over-pruning can hurt the health and development of your tree just like staking your tree can. If you are interested in learning an appropriate pruning schedule for your tree type, we recommend giving us a call so we can give you detailed advice and tree service. Trees are not like people, and to that point they do not heal like humans heal. Trees don’t exactly develop new tissue to heal over a wound, but they rather compartmentalize a problem. They make something called woundwood around the affected area, and are typically proficient in looking after themselves. Flash-cutting is a pruning technique that removes the entire branch collar, which obviously makes the wound larger than in it needs to be. Typically, a better idea is to cut off the branch outside the collar, because flash-cutting exposes the tree to pathogens looking to get inside and infect the tree. After planting your new tree, it is important to leave a well-soaked area so the roots are sufficiently nourished. But be sure you don’t water your new tree so frequently that it starts to drown. Frequent and light watering promotes shallow root growth, which is not ideal. Instead, water your trees less frequently, but more deeply. This will make sure your root system is deep and strong. Additionally, don’t stop watering your trees just because it’s gotten a bit cooler than in the high summer. If it happens to be a dry fall or winter, make sure you continue to water through the autumn and during warmer periods of the winter, whether it is an old or young tree. We partially addressed this in the point above, but tree injuries are also something you need to look out for during the winter months. Sometimes snow accumulation or animals can damage a tree by breaking branches or harming the trunk’s bark. Young trees can be protected by wrapping them around the base of the tree in a metal cloth or a sturdy, plastic guard. Burlap cloths are also an option worth consideration as they can protect the young tree from sustaining significant temperature damage as well. Just make sure you take them off as winter turns to spring. This will help them develop appropriately. Call Growing Earth Tree Care Today! We hope you’ve enjoyed picking up a few tips you will find handy down the road. If you have more specific questions we weren’t able to address in today’s post, just give us a call or reach out to us today. We would love to hear from you!